UK car maker Rolls-Royce has unveiled a luxury vehicle that gives a clear hint the company intends to add sportier and more technologically-advanced models to its limited stable. And if the new car sparks a good reaction from existing and potential Rolls-Royce customers, then there is a good chance the 101EX two-door coupe will be produced, according to Burkhard Goeschel, board member in charge of product development at Rolls-Royce's parent company BMW Group. 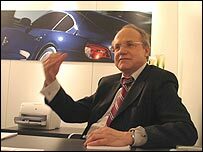 "We have to evaluate if the coupe can find customers," Mr Goeschel said in an interview with the BBC. "We are following the Rolls-Royce tradition, so the concept car is fully operational." Should there be a market for the car, then there are a limited amount of practical challenges involved in bringing it to market, he continued. The "body structure makes it very easy to make derivatives" based on Rolls-Royce's core model, the Phantom, Mr Goeschel said. It won't be the first time that Rolls-Royce has tweaked its product range. The company has already made a stretched version of its Phantom, and a convertible is currently being produced at the manufacturing plant at Goodwood in Sussex. Rolls-Royce is doing all it can to keep the convertible production car under wraps ahead of its likely launch next year, though it is believed to differ little from the 100EX concept convertible that was revealed at the Geneva motor show in 2004. If the 101EX coupe concept from this year's motor show - which like the 100EX is shown with rear hinged doors - follows a similar route to market, it could reach customers by the end of 2008. Mr Goeschel feels the car would help the company show its customers that "Rolls-Royce is not all about luxury, it is also about technology". The 101EX offers "a little bit more elegance, a little bit more technology" than the Phantom, he says. 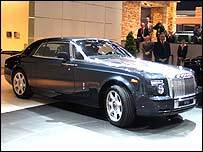 After a period of slower-than-anticipated sales following the return of Rolls-Royce under BMW's umbrella in 2003 - a period during which several chief executives came and went - the company now insists the £250,000 Phantom has established itself as the leader in the market for hyper-luxurious cars. "The Phantom has the top end of the market almost to itself," according to Rolls-Royce Motor Company chairman and chief executive Ian Robertson. Mr Goeschel said that the Phantom attracts a different set of customers from Bentley's slightly cheaper top model, the Arnage, insisting that "we don't compete in the same segment". "I'm not at all anxious about Bentley," he said. Unsurprisingly, Bentley Motors chief executive Franz-Josef Paefgen insists the Arnage is still ahead. "Arnage sales rose 15% last year to about 700 cars, and it outsold Rolls-Royce in all the four major markets we're operating in," he told the BBC, referring to North America, the UK, Germany and Japan. Whichever company is at the top of tree at the moment, both agree that it will take a heady mix of luxury and cutting-edge technology to stay there and keep luring the big spenders.